Hypnotik is one of those manufacturers that you may not find as common as others but has played a major role in the entirety of the BJJ competitive scene. 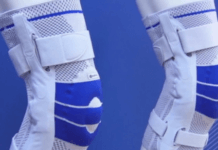 Their gis was worn by famous athletes like Rey De Leon, Caio Cesar Oliveria. They even had their own team that included the Gracie National Champion, UFC veterans and the ADCC champion. Aside from BJJ, you can find them making products for other fighting sports like MMA and boxing but it is the gis that they make which give them their recognition. Given below are some of their best works that you can also get for yourself from the market. The first product on the list is the Hypnotik Vortex lightweight gi which is recognized the IBJJF as a top option for competing athletes. 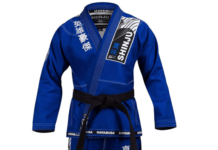 The construction of the gi is such that it is made out of high-tech reinforced single weave, it also has triple stitching along the corners which makes the gi one of the strongest and most ideal gear you can have when you are participating in a BJJ competition. 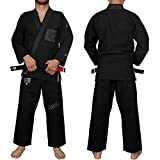 The pants are 10 oz with the same type of weave but are lightweight, and for good reason, since you can maneuver around the mat with more ease and perform sweeps with great efficiency. Best suitable for people who have long legs or are reluctant to sweep in any sparring match, the ZenRoll Hemp gi makes sure that your moves are as efficient as possible by giving you much freedom of movement along with easier execution because of low effort applied. The jacket is made out of 550 gsm hemp while the pants are 11 oz hemp, making both of these pieces tighter than your usual BJJ Gi. The ZenRollgi also allows for good airflow and with the foam collar, makes it easier on the practitioner because it absorbs the sweat. The construction of the gi is also really sturdy and comfortable, making it a worthwhile product to have in your BJJ routine. The Standard BJJ Gi is the flagship of Hypnotik as it is the product which is most common amongst the customers. 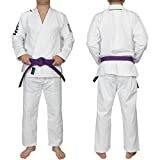 Within a reasonable price tag, you are given a gi which is sleek, stylish and has a remarkable design when compared to the other gis on the market. The jacket is made out of strong 550 GSM pearl weave while the pants with a 360 GSM twill cotton one. 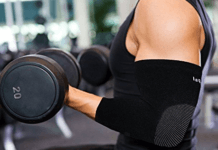 To fit your body without any interference, the gi comes preshrunk so that you don’t have to worry about size. 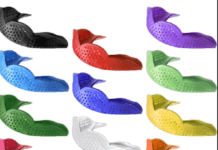 It is also quite comfortable to wear and gives good breathability when you train in it. Being an ideal option if you want to move into the higher stages of BJJ competitions, the ProMax 550 competition gi gives you everything that a contender needs from their gear. 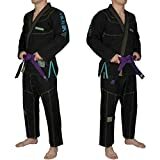 The feature that sets apart the Competition gi from the other gis by Hypnotic is the fit; the gi is tailored to fit your body properly and sticks close to it. With the gi sticking so close, you will not experience any baggy feeling or some matter of interference caused by a loose section of the gi. 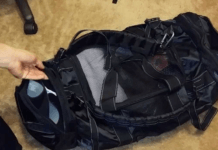 It also gives you a tactical advantage as the opponent has less surface area to grapple from as the gi does not give them enough leverage for a tight grip. One of Hypnotik’s premium product is the Project 001 Interstellar Gi and it lives up to the premium tag it is classified under by having the design that stands out amongst the majority of the competition. 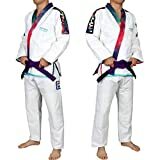 You can get this gi in either black or white but both of the models feature the interstellar colors, style, and logo all across the lapels, trims, arms and even the inside of the gi. 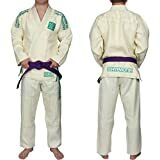 Not to mention that the gi is incredibly durable and made with high-quality material, able to withstand any sort of damage done during sparring or when using a stronger substance during washing it. The price tag is slightly higher because of the premium features but it more than enough makes up for it.